I didn't know much about Boundaries before I went to go see. I try now to go see a new movie in theaters every Saturday morning, and they usually end up being smaller films rather than the big tent pole blockbusters. And with a cast including Vera Farmiga (The Conjuring), Christopher Plummer (All the Money in the World), and Lewis MacDougall (A Monster Calls), Boundaries seemed too good to pass up. 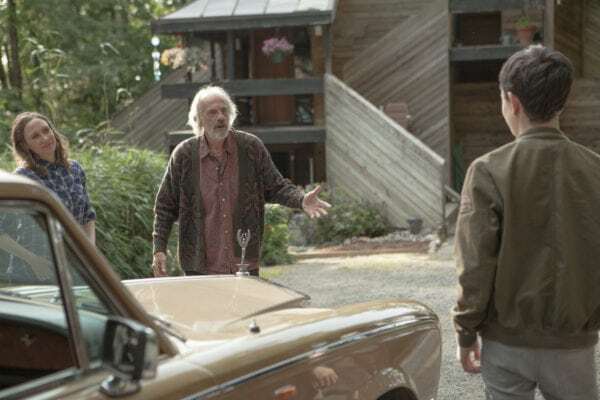 The film centers on a mother and her son as they go on a road trip with her estranged, weed-dealing father. And with that premise you have what seems like a pretty conventional story with some fresh flare to it, and that's exactly what Boundaries is. Narratively, this movie isn't offering up anything new. The story beats are pretty much exactly what you would expect them to be. However, the performances are fantastic, and the chemistry between all the actors is radiant. Paired with some really smart, witty humor from writer/director Shana Feste, and you have a nice little film that may not shatter worlds but stands on its own as an enjoyable Saturday morning movie. You have three excellent actors at the center of this film, and they all shine. I am a huge fan of Vera Farmiga, and she disappointed me earlier this year with The Commuter, so it's nice to see her back in a quality film giving a good performance. Her character is a little bit eccentric but in a lovable way, and she plays the role really well. Lewis MacDougall really proved just how capable of an actor he is in A Monster Calls. He was acting off of an Academy Award nominee in Felicity Jones, and he held his own. Here, he is probably the weakest of the trio but he still turns in a really good performance. He is a kid who struggles with how to relate to other people, and you can understand why he is a little bit different once you see who raised him. But the star of this film is undoubtedly Christopher Plummer. He is hardened and sarcastic, and plays an incredibly atypical grandfather, but Plummer plays the role perfectly. He delivers the hardest laughs, while also being responsible for some of the movie's best hard-hitting emotional scenes. This is a great trio of actors, as they are able to expertly navigate between riffing on each other and cracking jokes to playing up these emotionally-driven scenes. You can feel the history of this family, and it certainly feels like there is additional story that comes both before this movie and after as well, and that is not a feeling every movie can capture. I think it is mostly because these actors are so good in this film that you feel as if they are real people, and therefore it feels like you are just watching people within a snapshot of their lives rather than watching characters within a movie. My one big criticism with Boundaries is that the story is rather conventional. Sure, Christopher Plummer sells weed, which is an interesting spin, but other than that it doesn't really break any new ground with its narrative. And I don't think that necessarily hinders the film. It's a good movie, so clearly the formula works here. But I do wish Feste had maybe taken a few more risks with her storytelling instead of just falling back on what's been done before. It's a road trip film, and pretty much every beat of a road trip movie you can imagine happens. And like I said, that's not necessarily a bad thing. It just keeps the movie from feeling wholly original. But even if the story beats are kind of predictable and it never really goes beyond convention, what Feste does within the formula works. Overall, Boundaries is a nice little film. The performances are its shining quality, with Vera Farmiga and Lewis MacDougall turning in great work. 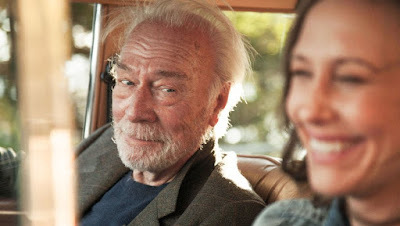 But Christopher Plummer absolutely steals the show. The script is witty and smart and, while it does fall back on conventional movie tropes, it still feels fresh being told through these characters. 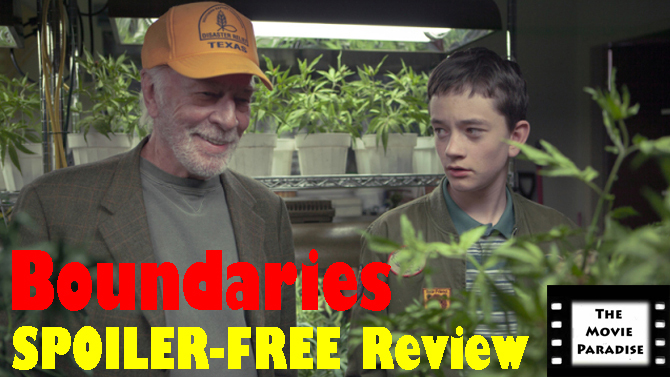 Boundaries doesn't necessarily need to be seen in theaters, but if it is available on some streaming service at some point, I do think it is worth checking out. What do you think? Have you seen Boundaries? If not, are you planning on seeing it? Leave your (spoiler-free) thoughts in the comments section below.